1. Gently peel off outer layer of skin from the beets. Slice and lay onto a plate. 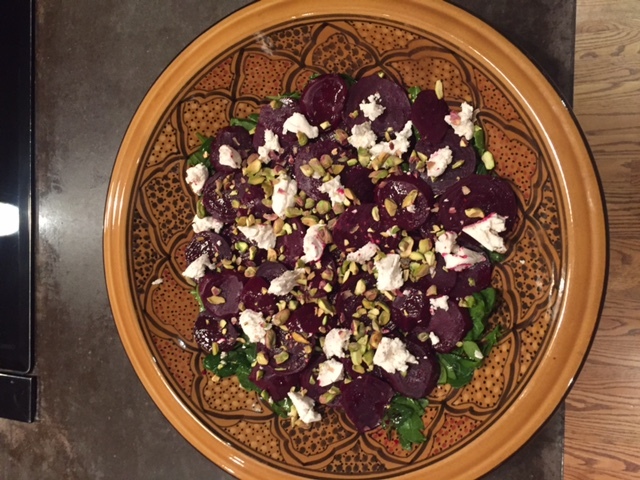 Pour the balsamic reduction over beets and let sit for an hour. 2. When I make my salad dressings I use a small mason jar so that I can really shake it up vigorously without spilling. In mason jar combine lemon, champagne and balsamic vinegars, olive oil, Dijon and agave. Shake vigorously and taste. If balsamic is too tart add more agave. Add salt and pepper and shake again. 3. 20 minutes before serving, toss the dressing onto the greens. 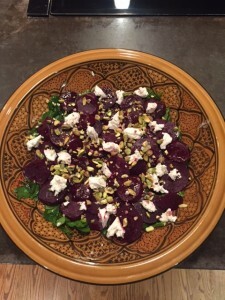 Place the beets over the top of the salad and garnish with chunks of goat cheese and pistachios.